1. What is his one-rep max? 5. 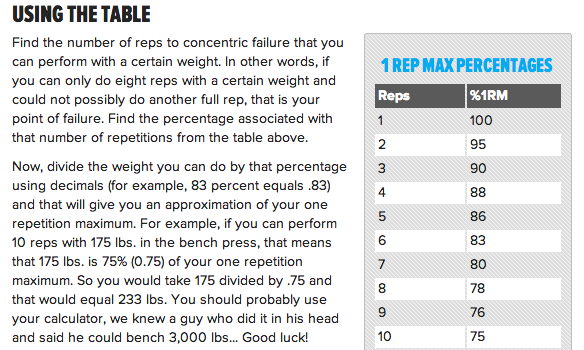 How does the website calculate a one-rep max? What formula could describe it? This is interesting. I’m not sure what standard either. I guess it depends on what you’re getting at. If you give the percent table then 6th or 7th grade. If you want kids to try to build functions then more alg 1 or 2. I threw some things in desmos (https://www.desmos.com/calculator/r5tnnsaxq1). Based on what I see it looks like they may be combining some different models at different regions. Wow this is awesome work! Thanks for the feedback. I agree that there doesn’t seem to be an exact match. I’m also a little perplexed about how to input the data since there are basically 3 different factors (reps, weight used, predicted 1 rep max weight). I agree you would need two different inputs to create the output of max weight for one rep. I was also trying to figure out how to put this into a table. Wow thanks so much, Jeremiah! You solved the mystery! I’ll add your comment to the post. Huge help!